This is Shelf Oddity's first decal sheet in this scale. It is for a 1/144 Spitfire and while no kit is noted on the package, I'm pretty sure this is for the Eduard kit. 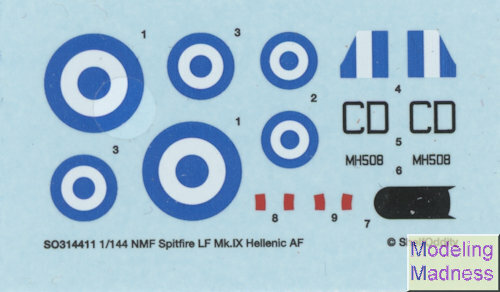 The sheet is superbly printed and provides the markings for a Greek aircraft in overall unpainted metal or perhaps aluminum paint. As seems to be popular, the instructions for the set are on-line and one simply downloads a .pdf file for this purpose. For those looking for something a bit different for the 1/144 clipped wing Spit, this would be a great choice. Hopefully Shelf Oddity will sell enough of these to make it worth doing other sheets. As a final note, there are standard waterslide decals and not ALPS printed. Thanks to Shelf Oddity for the review set. Get this item today at this link.